There are many beautiful sights in Hanoi but the most attractive sight may be Hoan Kiem Lake. Many people say that “Hoan Kiem Lake is the heart of Hanoi, the capital of Vietnam”. Hoan Kiem Lake, also known as Sword Lake, has accompanied with the historical development of Vietnam and associated with the spiritual Vietnamese’s life. From above looking down on the lake like a huge mirror with green water. Hoan Kiem Lake used to called Luc Thuy Lake ( Green Water Lake) because the water is green all the year around. And it was named Hoan Kiem Lake from 15th century with the legend “The Golden Turtle claim sword”. The legend tells that during the war against the Minh aggressors (1417-1427), King Le Thai To was given a precious fairy Sword by the Golden Turtle God. After 10 years of continuous struggling, the King finally defeated the Chinese and reclaimed the national independence. After that, on a nice day, while boating on Luc Thuy Lake, a large turtle came towards him. It immediately grabbed the sword with its mouth and submerged. He realized that the God must have lent him the sword to drive back the enemy, but then that his nation was free, the sword must be returned. Hence, King Le Thai To named Hoan Kiem Lake or Lake of the Restore Sword. In addition, the lake also associates with the famous architectural works such as: Tortoise Tower, Ngoc Son Temple, and The Huc Bridge. In the middle of the lake is Turtle Tower, so as to remind Vietnamese people of the Turtle God of his great assistance. Besides, the red Huc Bridge, which means "where the sun light is absorbed", curves like shrimp and led into Ngoc Son Temple. 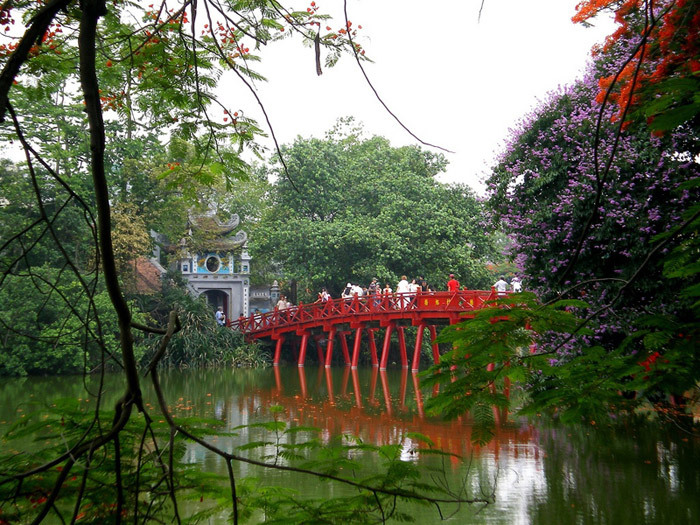 Hoan Kiem Lake has two small islands: Turtle Island and Ngoc Island where Ngoc Son Temple is located. In 1865, Nguyen Van Sieu remodeled Ngoc Son Temple on the Jade Island. On the Ngoc Boi Mountain, he built a tower of brush and on the tower, there were three words: "Ta Thien Thanh" or "write on blue sky". That tower is called But Tower today. Hoan Kiem Lake has a seasonal beauty with different colors: green in spring, red in summer, yellow in autumn and silver in winter. In the spring, the weather is warm. The trees come crashing buds and emerge. In the summer, it is hot but it is cooler in Hoan Kiem Lake. The flamboyant trees bloom with red flowers. In June, many people come to see barringtonia acutangula trees blossom. In the autumn, the leaves change the color into yellow and it makes Hoan Kiem Lake bring a calm beauty. In the winter, the weather is very cold. Bare trees make a very own beauty for Hoan Kiem Lake. You can enjoy many activities around Hoan Kiem Lake. In the early morning, many people come here to do morning exercises and breathe fresh air. In the course of one of the high profiled meetings in Hanoi, an Australian prime minister also joined the early jogging around the lake. In the afternoon, in the old quaterter, many colorful clothes and shoes will attract you. Besides that, the smell of street food also dazzles you. In the evening, when the lights turn on, Hoan Kiem Lake is more sparkling beauty because of decorative lights on trees around lake. Many couples hold hands and walk side by side along the lake. You can sit down on one of the stone bench, enjoy the view and have a good talk with some local friends. Hoan Kiem Lake is worth visiting repeatedly at different times of day and in any seasons in a year.